A new report on BOPP films for packaging delivers in-depth understanding on the consecutive growth path of the market along with the future scenarios and present situation of the market. The report offers an exclusive analysis of the global market and also presents insights on regional and other important segments. The market study conveys an overview of the overall scenario of the global BOPP films for packaging market. It features the competition prevalent among the present vendors in the market and also puts weight on the future circumstance of the market. The profile of the players is based on a SWOT examination sought down by company angle, product portfolio, strategies, finance related information, and year-to-year projections. The organizations have been explored minutely covering their key developments, innovations as well as mergers and acquisitions and agreements with other prominent establishments. The Porter’s Five Forces analysis has also been taken into account for research purposes in this report. The growing demand for innovative and novel packaging options is a noteworthy trend that is envisioned to open a plethora of growth prospects for the global BOPP films for packaging market. The global packaging industry is moving towards a new trend and players are replacing cellophane, waxing paper, and aluminum foils with BOPP films. This trend is expected to gain traction in the coming years owing to the fact that BOPP films are more flexible and also facilitate faster packaging with advanced sealing properties as compared to other packaging materials. This has impelled manufacturers to come up with new techniques pertaining to the production of BOPP films in order to cater to the demand of various industries. Food and beverage packaging products provide protection, resistance from tampering, and special biological, chemical, and physical needs for the respective food and beverages. Moreover, food packaging helps preserve the nutrition in food, and quick and dependable conveyance of food in the value chain aids in decreasing the various losses occurring post-harvest. The different kinds of packaging ingredients used in the food and beverages industry are inflexible plastic packaging, adaptable plastic packaging, BOPP films, wood packaging, stoneware packaging, paperboard packaging, metal packaging, leather packaging, vegetable filaments and material packaging, beverages jars, vaporizers and glass. The significant use of these packaging materials in the beverages industry can be seen in brew packaging, carbonated sodas packaging, caffeinated drinks packaging, prepared to drink ice tea packaging and mixed beverage packaging. It has been observed that an individual product may typically need more than one type of packaging. The packaging of food and beverages is backed by continuous innovation, for example, recoil wrapping, contract sleeve wrapping, altered environment packaging, fixed plate food packaging, vertical form fill and seal (VFFS) stowing, blade seal/stream wrap packaging, collapsing container packaging, and ridged case and plate packaging. There is a growing need for ready-to-eat foods comprising microwave suppers to cater to the needs of consumers with a hectic schedule. Expanding demand from the filtered water, tea, and carbonated soda pop markets is further increasing the demand for advanced packaging. Among all the above mentioned packaging types, BOPP films is the type of packaging that is used largely in the food and beverages industry owing to its healthy characteristics and inexpensive cost structure. The growing demand for cigarettes and other tobacco products is the essential growth driver for this market. An ascent in the quantity of female smokers is another core factor that has been impacting the growth of the global tobacco packaging market. Owing to the increased spending capacity and social autonomy, women have become a potential and rising target group for some organizations. Numerous cigarette producing organizations have created specialty brands engaging ladies. Nonetheless, the developing familiarity with death and disease because of tobacco utilization and stringent directives forced by governments across the globe is limiting the development of this market. The most preferred packaging used to package tobacco is paper box packaging. 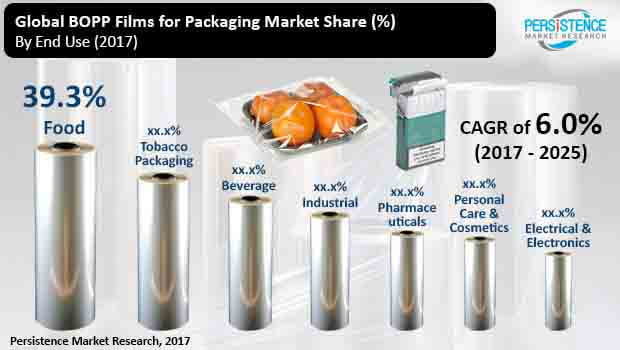 However, the trend of using BOPP films as they are safe and cost effective has been increasing rapidly in this sector, thus pushing tobacco packaging to the second place among the end users of BOPP films for packaging.